Preparing for a market can seem overwhelming. There are supplies to transport, displays to set up and potential customers to talk to. If you’re new to the market scene, we’re here to help. The following tips will help you prepare for whatever the event throws at you. Before diving in, make sure to check out the first post in this series, Are Markets Right for You? OK, let’s get started. A list of the supplies you need is really helpful. There are quite a few things to bring, so jotting it down will help you remember each one. There are really helpful lists on Pinterest to reference, like these from StudioDax and Creative Income. “Organization is key,” said Christie with Birchwood Botanicals. 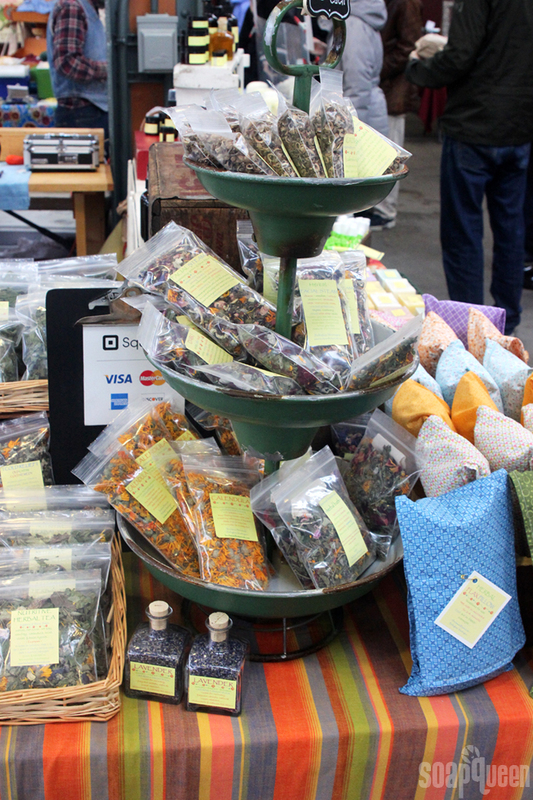 She’s been making soap and other herbal body care for about 37 years, and has been selling her lovely creations at the Farmers Market here in Bellingham since 2005. 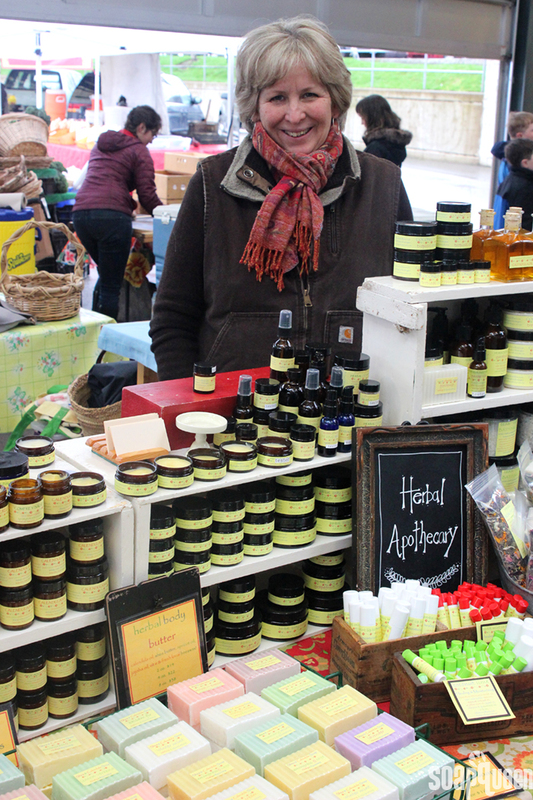 Christie with Birchwood Botanicals showcases her products at the Bellingham Farmers Market. Start by breaking the list into three categories – products, display supplies and miscellaneous. You can use more or fewer categories depending on your personal preference. For the first category, write down what products you plan to bring and how many. Researching the event beforehand can help you decide what to bring. A good place to start is about 5-10 each of your most popular items. As you build up your customer base, you can adjust and expand your product line to suit their needs. Samples and testers are essential. Shoppers can touch, smell and try the products, which will help bring them back for more. We all know once you try handmade soap, it’s hard to go back to store bought! The next category, display supplies, will include items like tables, a canopy, a price list, a cash box or money bag with plenty of change, debit/credit card readers, calculators, a hammer and nails, bags for your customers, etc. Christie brings several card readers and an extra phone charger. Susanne with Passionfruit Island said an apron with a zipper is really helpful. She sold her products at markets for about 7 years and is now focusing on online sales. You can carry samples, cash, business cards, etc. in the apron and hand them out easily. Passionfruit Island‘s beautiful display at a local market. The miscellaneous category includes anything else that’s helpful for you. That includes plenty of water, snacks, sunglasses, a hat, a coat, allergy medication, tissues, etc. Christie brings a portable office with her – that includes staplers, paper clips, extra pens, paper, tape, towels and cleaning wipes. That way she’s prepared for any possible scenario. Once you have the items you need, the next step is getting them from your house to the event. Christie recommends using clear plastic bins. It can be tempting to use cardboard boxes to cut costs, but clear bins allow you to see what products are inside so it’s easier to stay organized. As you put the items in your bins, make sure to check them off on your list so you don’t forget anything. You can use cloth, newspaper, etc. to protect your items. Susanne recommends packing the containers tightly so the products don’t jostle around in the car. “Pack them as full as you can,” she said. If you don’t have a lot of space in your car, you can pack your products in your displays. Susanne made shelves out of old wine boxes that were donated from a local grocery store. She was able to transport her products and display them in a fun and unique way. 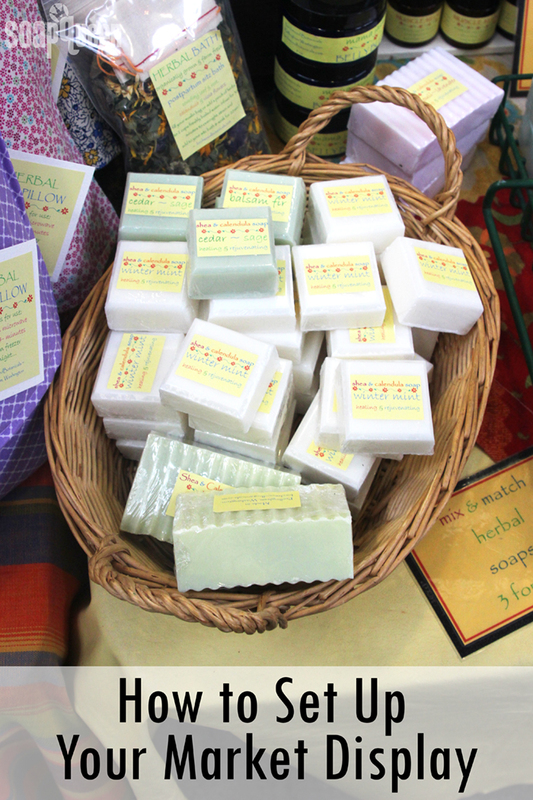 Soap displays that double as storage, like these by Passionfruit Island, save space in your car. Don’t be afraid to practice packing the items into your car so you know what to expect. You can also leave certain supplies in the car overnight. In the morning, all you have to do is load up the heat-sensitive items like soap and you’re ready to go. If you plan to sell at markets for a long time, consider investing in a trailer. Christie used to pack her items in an SUV, but now has a trailer where she keeps her props, tables, etc. In many markets space will be limited, so Susanne and Christie suggest going vertical with your display. “We cannot always spread out, but we can always go up,” Christie said. Christie with Birchwood Botanicals creates vertical displays to showcase her products in small spaces. Sturdy, tall shelves are a great option for market displays. Susanne recommends putting the products at eye level so people can see them easily. Group your products in sets and have an easy-to-read price list so your display is organized and inviting. Make sure to take advantage of any leftover space on your table as well. You can display your products in cute baskets or platters, and it’s also a great place to put any testers or samples. Once you have an idea of what your display will look like, set it up at home. Take notes on how long it takes you. If you notice you’re having difficulty with a certain product or you don’t have enough space, you can adjust your display until it works well for you. When you’re finished, take photos so you can reference it the next time you set up your display. Get more tips in the Selling Success at Fairs and Public Markets post. Keep in mind your display may change based on the weather. An eye-catching display is a great way to attract customers. The thought of designing it can be intimidating, but Susanne said it doesn’t have to be. “One of the things I wish I had known when I first started is that it doesn’t need to cost a lot,” she said. She recommends not investing a lot of money on trinkets. Instead, opt for simple shelves, tablecloths and baskets. Not only will your display look clean and modern, but your products will really stand out against a neutral background. You can find shelves and other display items at thrift stores and garage sales. 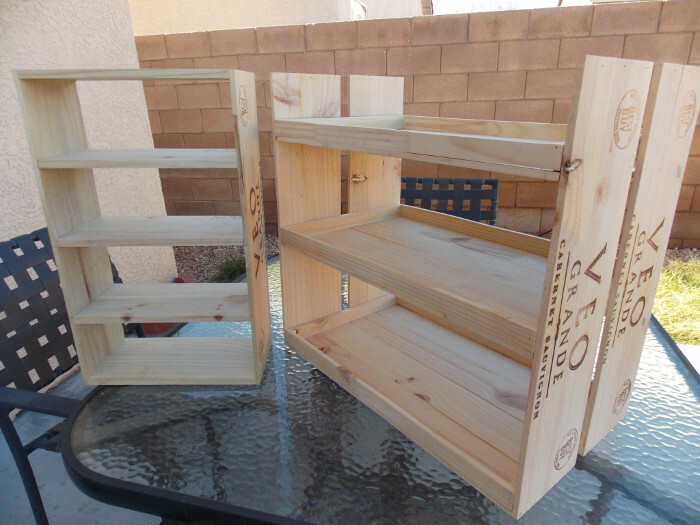 If you’ve got a knack for DIY projects, you can find low-cost or free materials and build the shelves from scratch. 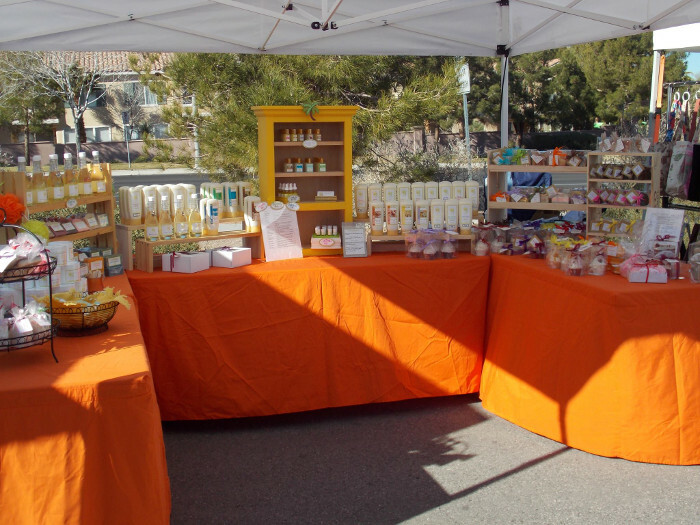 Susanne’s colorful products really stand out on a simple market display. Christie found a lot of her display items at second-hand stores. Over the years she collected plenty of props like lamps and picture frames. She also likes to bring a a selection of flowers like Lily of the Valley from the farm. They double as an item for display and an item for sale. If you’re not sure where to start, Pinterest and Facebook have plenty of ideas. Instagram is also a great place for inspiration, especially the #SoapShare tag. Don’t be afraid to ask other crafters on those social media platforms. 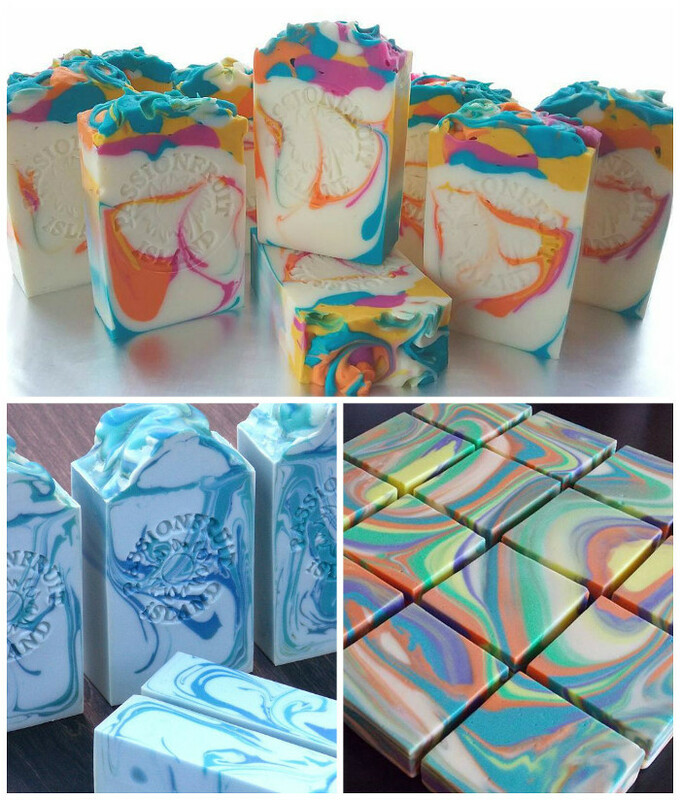 The soapmaking community is really helpful and they have tons of amazing ideas. Designing your display doesn’t have to be a chore – it’s a great opportunity to showcase the wonderful products you worked hard to create. If it’s not exactly what you want, keep tinkering with items until it is. The more markets you go to, the more you will learn about your display and selling your products.